All Judas Priest items listed below are authentic and very limited. We do not carry multiple items. All prices and availability are subject to change. All prices include shipping and handling for all USA customers. All other destinations will require actual shipping cost to complete transaction. Have a question? Ask us before purchasing the item. Thank You. 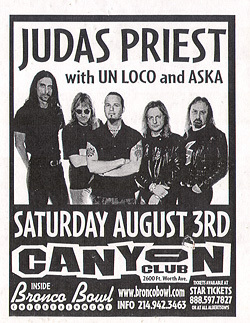 Description: 5x7 BW Judas Priest 1998 concert handbill. 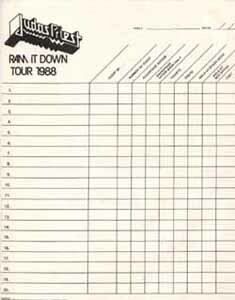 Description: 1989 Judas Priest Ram It Down Guest List form. Carbon copy form used for the bands Guest List at each event. 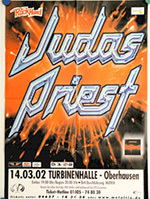 Description: 2002 Judas Priest German Concert Poster. Size 24x34. Item in VG+ condition. Shipped Folded.